Roger Ebert: The problem with seeing characters in a highly stylized visual way is that it's hard for them to breathe and move and get us involved in their stories. That's what happens here. 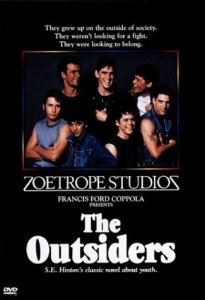 The thin narrative material for "The Outsiders" only adds up to a movie of 90 minutes, and even then there are scenes that seem to be killing time. Nothing that happens in the movie seems necessary; it's all arbitrary. This is Matt Dillon's second outing in material by S. E. Hinton. In "Tex" he played a three-dimensional character, complicated and convincing. In "The Outsiders," he's required to do little more than standard "Rebel Without a Cause" behavior. The problem, I'm afraid, is with Coppola's direction. He seems so hung up with his notions of a particular movie "look," with his perfectionistic lighting and framing and composition, that the characters wind up like pictures, framed and hanging on the screen. There's not much life in this movie, or spontaneity. It's a stylistic exercise. The man who made the "Godfather" pictures and "Apocalypse Now" is a great director. He ought to reserve these exercises for the rehearsal halls of his fancy and get back to making movies. Den of Geek: The cinematography in the film is gorgeous. This can be credited to shooting the film in cinemascope. The striking sunsets and shallow focus make it look like a film from the Hollywood studio era rather than one that came out in 1983, and the authenticity of the costumes, along with the lyrical dialogue, only add to this. There’s one scene where the Greasers and Socs are having a “rumble” (a fight) and with the lashing rain coming down, it looks like an homage to Kurosawa’s Seven Samurai. Meanwhile, it’s pretty clear that Coppola was concerned with giving the film a realist style, using the true locations where the novel had been set, as well as minimal lighting in exterior shots. This stunning contrast is what makes the film so stunning, and it is as beautiful as any of Coppola’s other films. Vivid memory of watching this in junior high. The slang was thick and heavy and we loved it. Discussion of the book on the blue, last year. The movie is remarkable to me mostly because of the cast, which is packed with just about every hot young dude of the eighties--it's only really missing Michael J. Fox and Kevin Bacon. That quote from Ebert above surprises me. Most movies for teens like this don't get this kind of gorgeous cinematography, and I think that's part of what made it memorable to those of us who were around the age of the characters when the movie came out. It wasn't teen schlock, it was a seriously crafted film.